12:1.1 The universe of universes is not an infinite plane, a boundless cube, nor a limitless circle; it certainly has dimensions. The laws of physical organization and administration prove conclusively that the whole vast aggregation of force-energy and matter- power functions ultimately as a space unit, as an organized and co-ordinated whole. The observable behavior of the material creation constitutes evidence of a physical universe of definite limits. The final proof of both a circular and delimited universe is afforded by the, to us, well-known fact that all forms of basic energy ever swing around the curved path of the space levels of the master universe in obedience to the incessant and absolute pull of Paradise gravity. 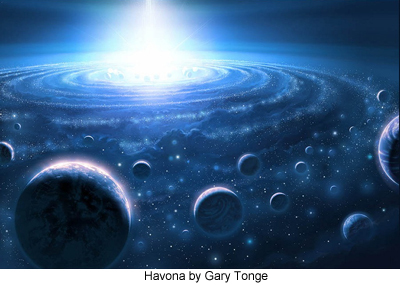 12:1.11 The Paradise-Havona System, the eternal universe encircling the eternal Isle, constitutes the perfect and eternal nucleus of the master universe; all seven of the superuniverses and all regions of outer space revolve in established orbits around the gigantic central aggregation of the Paradise satellites and the Havona spheres. 12:1.12 The Seven Superuniverses are not primary physical organizations; nowhere do their boundaries divide a nebular family, neither do they cross a local universe, a prime creative unit. Each superuniverse is simply a geographic space clustering of approximately one seventh of the organized and partially inhabited post-Havona creation, and each is about equal in the number of local universes embraced and in the space encompassed. Nebadon, your local universe, is one of the newer creations in Orvonton, the seventh superuniverse. 12:1.13 The Grand Universe is the present organized and inhabited creation. It consists of the seven superuniverses, with an aggregate evolutionary potential of around seven trillion inhabited planets, not to mention the eternal spheres of the central creation. But this tentative estimate takes no account of architectural administrative spheres, neither does it include the outlying groups of unorganized universes. The present ragged edge of the grand universe, its uneven and unfinished periphery, together with the tremendously unsettled condition of the whole astronomical plot, suggests to our star students that even the seven superuniverses are, as yet, uncompleted. As we move from within, from the divine center outward in any one direction, we do, eventually, come to the outer limits of the organized and inhabited creation; we come to the outer limits of the grand universe. And it is near this outer border, in a far-off corner of such a magnificent creation, that your local universe has its eventful existence. 12:1.14 The Outer Space Levels. Far out in space, at an enormous distance from the seven inhabited superuniverses, there are assembling vast and unbelievably stupendous circuits of force and materializing energies. Between the energy circuits of the seven superuniverses and this gigantic outer belt of force activity, there is a space zone of comparative quiet, which varies in width but averages about four hundred thousand light-years. These space zones are free from star dust—cosmic fog. Our students of these phenomena are in doubt as to the exact status of the space-forces existing in this zone of relative quiet which encircles the seven superuniverses. But about one-half million light-years beyond the periphery of the present grand universe we observe the beginnings of a zone of an unbelievable energy action which increases in volume and intensity for over twenty-five million light-years. These tremendous wheels of energizing forces are situated in the first outer space level, a continuous belt of cosmic activity encircling the whole of the known, organized, and inhabited creation. 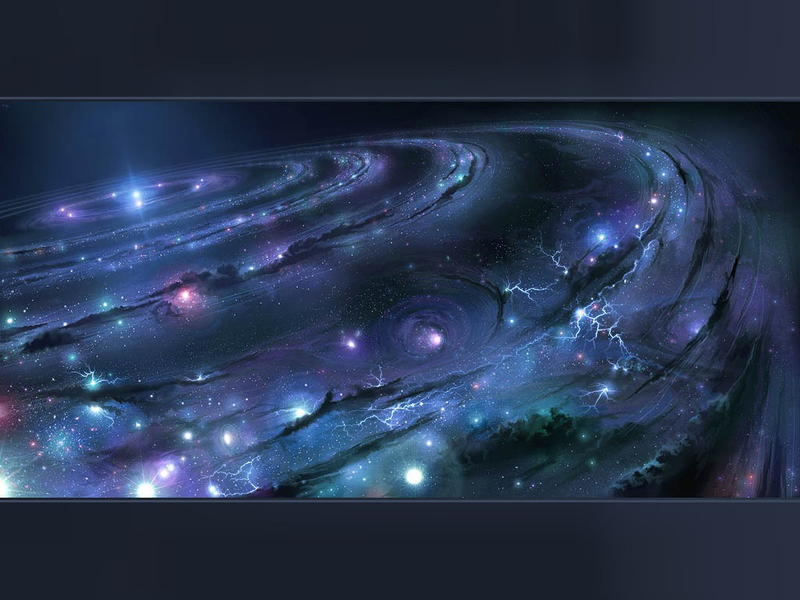 12:1.15 Still greater activities are taking place beyond these regions, for the Uversa physicists have detected early evidence of force manifestations more than fifty million light-years beyond the outermost ranges of the phenomena in the first outer space level. These activities undoubtedly presage the organization of the material creations of the second outer space level of the master universe. 12:1.16 The central universe is the creation of eternity the seven superuniverses are the creations of time the four outer space levels are undoubtedly destined to eventuate-evolve the ultimacy of creation. And there are those who maintain that the Infinite can never attain full expression short of infinity; and therefore do they postulate an additional and unrevealed creation beyond the fourth and outermost space level, a possible ever-expanding, never-ending universe of infinity. In theory we do not know how to limit either the infinity of the Creator or the potential infinity of creation, but as it exists and is administered, we regard the master universe as having limitations, as being definitely delimited and bounded on its outer margins by open space. 12:2.4 The Uversa star students observe that the grand universe is surrounded by the ancestors of a series of starry and planetary clusters which completely encircle the present inhabited creation as concentric rings of outer universes upon universes. 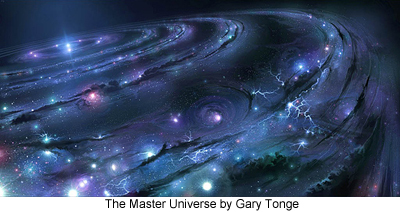 The physicists of Uversa calculate that the energy and matter of these outer and uncharted regions already equal many times the total material mass and energy charge embraced in all seven superuniverses. We are informed that the metamorphosis of cosmic force in these outer space levels is a function of the Paradise force organizers. 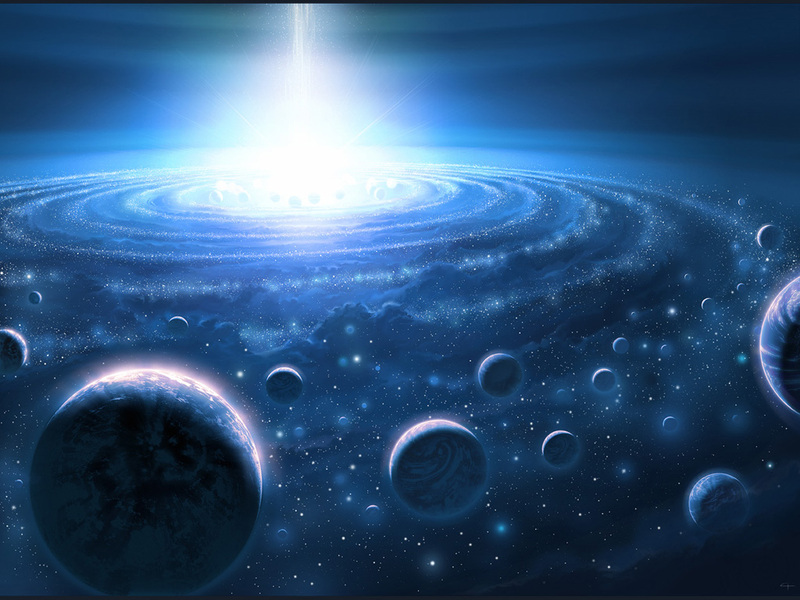 We also know that these forces are ancestral to those physical energies which at present activate the grand universe. The Orvonton power directors, however, have nothing to do with these far- distant realms, neither are the energy movements therein discernibly connected with the power circuits of the organized and inhabited creations. 12:3.6 These four circuits are not related to the nether Paradise force center; they are neither force, energy, nor power circuits. They are absolute presence circuits and like God are independent of time and space. 12:3.8 1. Physical Gravity. Having formulated an estimate of the summation of the entire physical- gravity capacity of the grand universe, they have laboriously effected a comparison of this finding with the estimated total of absolute gravity presence now operative. These calculations indicate that the total gravity action on the grand universe is a very small part of the estimated gravity pull of Paradise, computed on the basis of the gravity response of basic physical units of universe matter. 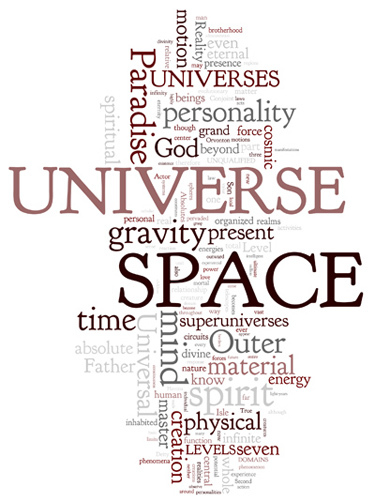 These investigators reach the amazing conclusion that the central universe and the surrounding seven superuniverses are at the present time making use of only about five per cent of the active functioning of the Paradise absolute-gravity grasp. In other words: At the present moment about ninety-five per cent of the active cosmic-gravity action of the Isle of Paradise, computed on this totality theory, is engaged in controlling material systems beyond the borders of the present organized universes. These calculations all refer to absolute gravity; linear gravity is an interactive phenomenon which can be computed only by knowing the actual Paradise gravity. 12:3.9 2. Spiritual Gravity. By the same technique of comparative estimation and calculation these researchers have explored the present reaction capacity of spirit gravity and, with the co-operation of Solitary Messengers and other spirit personalities, have arrived at the summation of the active spirit gravity of the Second Source and Center. And it is most instructive to note that they find about the same value for the actual and functional presence of spirit gravity in the grand universe that they postulate for the present total of active spirit gravity. In other words: At the present time practically the entire spirit gravity of the Eternal Son, computed on this theory of totality, is observable as functioning in the grand universe. If these findings are dependable, we may conclude that the universes now evolving in outer space are at the present time wholly nonspiritual. And if this is true, it would satisfactorily explain why spirit-endowed beings are in possession of little or no information about these vast energy manifestations aside from knowing the fact of their physical existence. 12:3.10 3. Mind Gravity. By these same principles of comparative computation these experts have attacked the problem of mind-gravity presence and response. The mind unit of estimation was arrived at by averaging three material and three spiritual types of mentality, although the type of mind found in the power directors and their associates proved to be a disturbing factor in the effort to arrive at a basic unit for mind-gravity estimation. There was little to impede the estimation of the present capacity of the Third Source and Center for mind-gravity function in accordance with this theory of totality. Although the findings in this instance are not so conclusive as in the estimates of physical and spirit gravity, they are, comparatively considered, very instructive, even intriguing. These investigators deduce that about eighty- five per cent of the mind-gravity response to the intellectual drawing of the Conjoint Actor takes origin in the existing grand universe. This would suggest the possibility that mind activities are involved in connection with the observable physical activities now in progress throughout the realms of outer space. While this estimate is probably far from accurate, it accords, in principle, with our belief that intelligent force organizers are at present directing universe evolution in the space levels beyond the present outer limits of the grand universe. Whatever the nature of this postulated intelligence, it is apparently not spirit-gravity responsive. 12:3.11 But all these computations are at best estimates based on assumed laws. We think they are fairly reliable. Even if a few spirit beings were located in outer space, their collective presence would not markedly influence calculations involving such enormous measurements. 12:3.12 Personality Gravity is noncomputable. We recognize the circuit, but we cannot measure either qualitative or quantitative realities responsive thereto. 12:4.13 When the universes expand and contract, the material masses in pervaded space alternately move against and with the pull of Paradise gravity. The work that is done in moving the material energy mass of creation is space work but not power- energy work. 12:6.3 The Third Source and Center assists in the maintenance of the equilibrium and co-ordination of the combined physical and spiritual energies and organizations by the absoluteness of his grasp of the cosmic mind and by the exercise of his inherent and universal physical-and spiritual-gravity complements. Whenever and wherever there occurs a liaison between the material and the spiritual, such a mind phenomenon is an act of the Infinite Spirit. Mind alone can interassociate the physical forces and energies of the material level with the spiritual powers and beings of the spirit level. 12:6.13 The Unqualified Absolute pervades all space. We are not altogether clear as to the exact status of the Deity and Universal Absolutes, but we know the latter functions wherever the Deity and Unqualified Absolutes function. The Deity Absolute may be universally present but hardly space present. The Ultimate is, or sometime will be, space present to the outer margins of the fourth space level. We doubt that the Ultimate will ever have a space presence beyond the periphery of the master universe, but within this limit the Ultimate is progressively integrating the creative organization of the potentials of the three Absolutes. 12:7.1 There is operative throughout all time and space and with regard to all reality of whatever nature an inexorable and impersonal law which is equivalent to the function of a cosmic providence. Mercy characterizes God's attitude of love for the individual; impartiality motivates God's attitude toward the total. The will of God does not necessarily prevail in the part—the heart of any one personality —but his will does actually rule the whole, the universe of universes. 12:8.1 “God is spirit,” but Paradise is not. The material universe is always the arena wherein take place all spiritual activities; spirit beings and spirit ascenders live and work on physical spheres of material reality. 12:8.16 The brighter the shining of the spiritualized personality (the Father in the universe, the fragment of potential spirit personality in the individual creature), the greater the shadow cast by the intervening mind upon its material investment. In time, man’s body is just as real as mind or spirit, but in death, both mind (identity) and spirit survive while the body does not. A cosmic reality can be nonexistent in personality experience. And so your Greek figure of speech—the material as the shadow of the more real spirit substance—does have a philosophic significance. 12:9.1 Spirit is the basic personal reality in the universes, and personality is basic to all progressing experience with spiritual reality. Every phase of personality experience on every successive level of universe progression swarms with clues to the discovery of alluring personal realities. Man’s true destiny consists in the creation of new and spirit goals and then in responding to the cosmic allurements of such supernal goals of nonmaterial value.